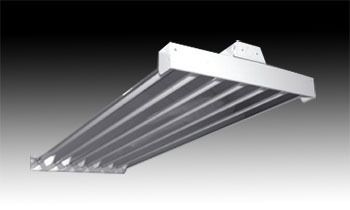 Premium-grade high-performance high or low bay luminaire. For use with indoor applications where high-efficiency, high-performance and ease of installation are required. Separate ballast compartment allows for surface metal area to conduct heat away from the temperature sensitive parts, thus combining for high ambient operation. This luminaire’s wide body and wide beam light distribution makes it ideal as an HID alternative or replacement.